Welcome back! 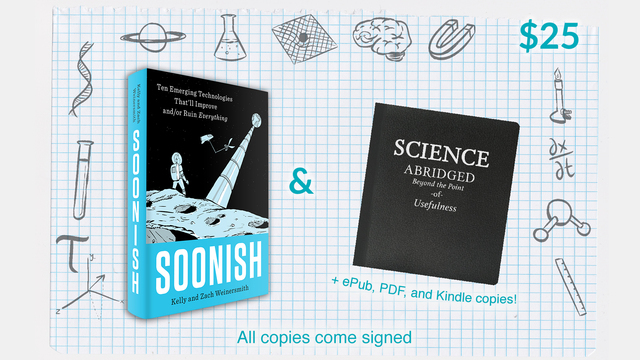 Zach and Kelly promised to record an episode of The Weekly Weinersmith about the making of Zach’s new book “Science – Abridged Beyond the Point of Usefulness” as a preorder reward for their new book Soonish! “Science – Abridged Beyond the Point of Usefulness” will be available through BackerKit for another week or two, and will then likely be available through the SMBC store for Christmas. Soonish is available through BackerKit and can be preordered through these stores. Check out the space elevator to see what other rewards are available to folks who preorder the book. This entry was posted in Podcast and tagged Science, Soonish on August 22, 2017 by KWeinersmith.